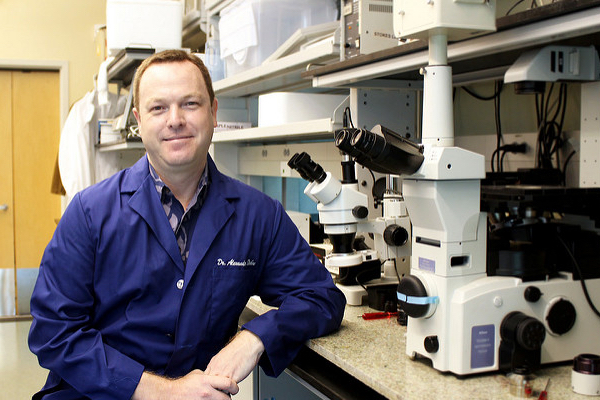 Pictured: Dr. Alex Stokes in his lab at the University of Hawaiʻi medical school. Amanda Shell photo. Heart failure may be slowed and even reversed by the use of TRPV1, a “cannabinoid receptor” that binds and reacts to components of marijuana, according to research led by a team at the University of Hawaiʻi John A. Burns School of Medicine (JABSOM). Alexander Stokes, a JABSOM assistant professor in cell and molecular biology, said the potential medical benefits of using cannabis-based therapies for the treatment of heart disease are promising. The findings were detailed in the peer-reviewed journal Channels. In addition to Stokes, co-authors include researchers from GB Sciences Inc. (GBLX) and Kyoto University in Japan. Funding for the pre-clinical studies, led by Stokes, was provided through grants awarded by the National Institutes of Health and the Hawai‘i Community Foundation. Stokes is among the researchers in the newly awarded grant designed to establish the Diabetes Research Center of Excellence at JABSOM. “Heart disease and diabetes are a rapidly expanding menace in America, with Native Hawaiian and Pacific Islander populations having up to twice the likelihood of showing these diseases than other ethnic groups in the islands,” said Mariana Gerschenson, JABSOM professor and Diabetes Research Center director. Stokes is president and founder of Makai Biotechnology LLC, a Hawai‘i-based cardiovascular therapy company that is developing novel therapies for the treatment of heart failure, in collaboration with GBLX. UH holds an interest in Makai Biotechnology and may receive future revenue derived from this intellectual property. For more information, see the research paper. News media interested in contacting Dr. Stokes or receiving video or photographs from his laboratory should contact JABSOM Communications Director Tina Shelton.